Many have sought to harness the corruptive magic of the Void. Most who tried have fallen into madness. Determined to use this power for the good of Azeroth, Alleria Windrunner is the first mortal to succeed at defying the shadow's whispers. Coming to the aid of a group of her kin who nearly gave in to the darkness, Alleria has vowed to train these Void Elves to control the shadows within them and pledge their newfound powers to the Alliance. Seeking to harness the corruptive magic of the Void, these outcast elves endured an unexpected transformation. They are determined to master their newfound powers and resist the whispers eager to lure them into madness. One of the new Allied Races coming in the Battle for Azeroth expansion, the Ren'dorei were first introduced on Argus in the Legion expansion. Note, Allied Races start at level 20, and with the new level scaling from 7.3.5, Void Elves can quest in any zone requiring a 10-60 level range, as long as said zone has Alliance quests. Like me, they have been changed by the void, but their hearts and minds remain their own. Racials: Void Elf racials are Void/Shadow-oriented. Spatial Rift Spatial Rift - Rip a rift in space and time. Reactivate this ability to teleport through the rift..
Chill of Night Chill of Night - Reduces Arcane and Shadow damage taken by 1%..
Entropic Embrace Entropic Embrace - Your abilities have a chance to empower you with the essence of the Void (Entropic Embrace). Ethereal Connection Ethereal Connection - Reduces the cost of Void Storage and Transmogrification by 50%. Preternatural Calm Preturnatural Calm - Your spell casts are not delayed by taking damage. Physique equivalent to Blood Elves and High Elves. Must maintain control over the void within. Haughty and Sassy, like the Blood Elves they once were. When an Allied Race is leveled from 20 to 110 (sans boost), the player gets Heritage of the Void, an achievement that unlocks a set of Heritage armor to use on that race for their account. Lady Void Elf in the Heritage gear in the wowhead Dressing Room! Ren'dorei Cloak - Hotfixed in. to be added, but seemingly broken, currently, as it's flagged as "Horde"
As a rule, I don't sprout tentacles. But in your case, I'll make an exception. When studying shadow magic, one learns to be flexible. Very... flexible. You sate my hunger... and I'll sate yours. I know what you're thinking... "Oh goody, another elf." Well... I bet you weren't expecting a VOID elf, now were you? If you're looking for tall dark, and brooding, that's me. Well, dark and brooding, at least. Say what you will about the tenets of the Void. At least it's an ethos! Would you believe purple has always been my favorite color? Even before I went void, I mean. Alleria is my favorite Windrunner sister. Edgier than Vereesa, but slightly less homicidal than the dead one. The fact that I wield void energies doesn't mean I plan to consume everything I see. After all, I have a figure to maintain. They say the Void hungers. Let's start off with a bit of nibbling. Get nice and close. Whispers are kinda my thing. Are you checking out my void form? Who needs the Light? It's so much more fun in the dark. You cannot a-void my charms. The Void isn't the only thing that's insatiable. No, we do not drink blood--that's the San'layn. Totally different emo elf. First was high, then blood, and now void. Get the order right. Who does my hair? You might have heard of my stylist. It's called THE VOID. Gloomy? I'm not gloomy. I just dress that way... and talk that way... and act that way. You think YOU have a dark side? Elf, please. Well, yes, technically the Void does want to consume the entire cosmos. But I'll settle for a smaller bite... for now. No matter how much you plead, I will not sprout tentacles or turn into a giant eyeball. Well, I might. But not because you asked. Looking for other Void-themed or Shadow-themed mounts? Looking for a High Elf mount? Maybe you're looking for a void/shadow ish themed weapon? Maybe you're looking for a void/shadow ish themed gearset? Maybe you're looking for a void/shadow themed/colored battle pet? Maybe you're looking for a High Elf themed battle pet? Am I understanding this correctly? You have to have the unlocks on a character of the same faction? That is >hilarious< for people who only play one faction, and by that I mean: go ^&*! yourselves, Blizzard. Void Elf intro (narrated by Alleria Windrunner): The Void. A force of infinite hunger. Its whispers have broken the will of dragons... and lured even the titans' own children into madness. Sages and scholars fear the Void. But we understand a truth that they do not. That the Void is a power to be harnessed... to be bent by a will strong enough to command it. The Void has shaped us... changed us. But you will become its master. Wield the shadows as a weapon to save our world... and defend the Alliance! Do they start the Argent Tournament through the Darnassus delegation? 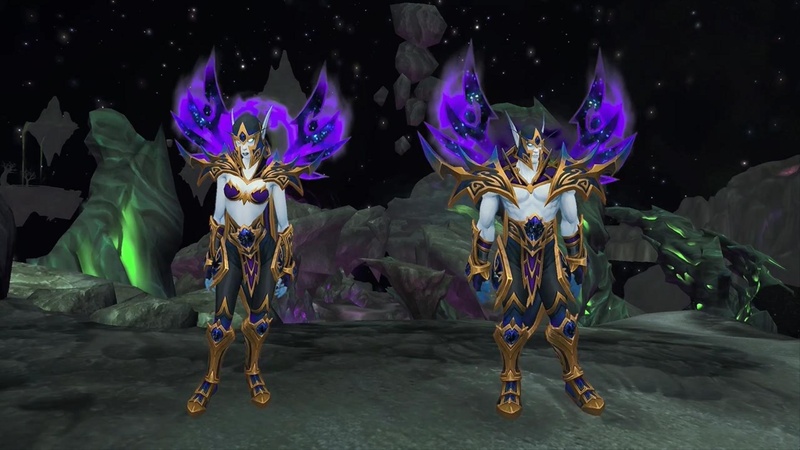 Once earned, the heritage armor can be used by any Void Elf alts, including low level, boosted and race changed ones. I want to create warlock, but don't unlock Void Elfs. Any reason too create non Void Elf caster character? Anyone else noticed their hair just randomly electrifies?